In 1943 Nikki Homer began breeding cats at the age of 16. Siamese were the first cats bred at her Shawnee Cattery, but it was her work with Burmese and American Shorthairs that led to the establishment of an entirely new breed, the Bombay cat. Her inspiration was the black leopard of India and she decided to name the breed after the Indian city of Bombay. In 1953 she began by breeding a female sable Burmese cat with a male American Shorthair black cat with the copper eye color she wanted. 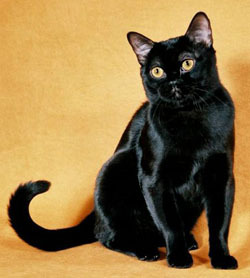 The first attempt at breeding a Bombay cat resulted in black kittens since black is dominant to sable, but each black cat carried the recessive gene for sable. It took many more litters of line breeding and cross breeding to achieve the breed standard glossy black cat with gold to copper eyes. By 1958 she was consistently producing what we know today as the Bombay cat. The Cat Fancier’s Association was the first to recognize the Bombay cat as a new breed in 1976. There is only one type of Bombay cat. This breed must be a true a black cat. The coat must must be black from root to tip and all pads and nose leather must be black. The only variation is in eye color. Eyes may range from gold to deep copper in color. The Bombay cat is known as “the patent leather kid with the copper penny eyes”. In England black cats of the Asian body type are known as British Bombay. In Great Britain the eyes may also be greenish in color in addition to the American standard of copper to gold. The Bombay cat is a muscular medium sized cat with well proportioned legs and a rounded chest. They are often heavier than they appear. Males generally weigh between eight and eleven pounds and females usually weigh between six and nine pounds. These cats have a medium sized round head and short muzzle. Although the muzzle is short and the nose is slightly rounded, it should never be snubbed. The ears are medium sized and set wide on the head. Their round head and large eyes give them a sweet expression. The Bombay cat’s most arresting feature is it’s eyes. They can range from gold to copper, with copper being the preferred color. For show purposes, the coat is always black, short and fine with a satin-like feel and a patent leather sheen. However, since this is a hybrid breed, there are occasionally sable colored kittens in a litter. They are not allowed in the show ring, but still make excellent pets. Bombay cats are highly intelligent and can often even be leash trained. They love to play fetch and some are quite talkative. They get along well in households with other animals, but do have a tendency to dominate other cats. The Bombay cat is extremely affectionate and when not nestled in the lap, often likes to ride on the owner’s shoulder. Much like the Burmese, the Bombay cat is a heat seeker and when not nestled on someone’s lap, they can often be found snuggled under the bed covers. They are not shy or timid and are frequently the first to greet guests. The Bombay cat has been described as the perfect pet for someone who wanted a panther, a dog, or a monkey. The Bombay cat combines the look of a panther with the loyalty of a dog mixed with the agility and playfulness of a monkey to create a delightful companion. This black cat rarely sheds and it’s short, tight coat needs almost no maintenance. Since they love human interaction, brushing is always welcome, but seldom necessary. A Bombay cat will do well on high quality dry food, but will appreciate an occasional treat of canned food or raw meat. The Bombay cat is known to have a hearty appetite and although most do well free-feeding, some have a tendency to gain weight. This can be handled by rationing food or by switching to a low calorie feed. The Bombay cat is the quintessential black cat. The black cat is the subject of folklore around the world. In ancient Egypt all cats, including black ones, were revered and those who could afford it had their cats mummified in order to be together throughout eternity. In the south of France the black cat is known as the Matagot. This spirit can take many forms, but is most often a black cat. This magician cat is said to bring the family good luck and prosperity as long as it is given the first bites of every meal and treated with the proper respect. In Ireland the black cat is often the helper of those who are healers. On the Yorkshire coast of England a black cat was kept by fisherman’s wives to ensure their safe return from sea. It is said that whoever finds a single white hair on an all black cat and pulls the hair without getting clawed will be both wealthy and lucky in love. A black cat in the theater on opening night assures the play will be a success. In Scotland, if a strange black cat comes to the house, it will bring prosperity. If a black cat walks onto a ship and then walks off, the ship will sink on its next voyage. In Asia a black cat is considered lucky. If a black cat walks towards you, it brings good luck – if it walks away, it takes the good luck back. During the middle ages people came to associate black cats with witches. Superstition and paranoia were rampant in Europe during this time. Some people believed that the black cat was the witches servant or familiar spirit, sent out to do her bidding. Some people believed that the black cat was the witch herself taking another form. There were even those who believed that a black cat was a magic cat and had supernatural powers of their own. In Finland it was believed that black cats carried the souls of the dead to the other world. 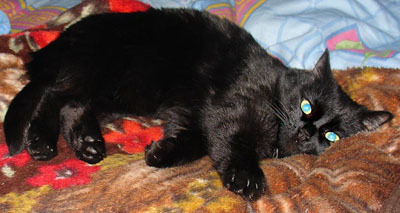 In Germany it was believed that if a black cat jumped on the bed of someone who was sick, death was imminent. Practitioners of the occult believed that every black cat had one bone somewhere in its body that could make its owner invisible. The cat was boiled alive and each bone was placed in the mouth while an assistant watched. When the right bone was placed in the mouth, the owner became invisible. The assistant would alert the practitioner when they saw them disappear and this is the bone that would be kept in a secret place until needed. In areas of the south where hoodoo and voodoo are still practiced the black cat is still used today. In hoodoo tradition, the black cat is seen as good luck. A black cat mojo bag is filled with good luck herbs and roots and carried on the person for good luck. These bags either have a black cat charm attached, or can be sewn from black cloth in the shape of a cat. In voodoo, these good luck bags are called black cat juju dolls. Some are plain and some are adorned with buttons, good luck charms, feathers, and ribbons. Even today some people believe that it is bad luck for a black cat to cross your path. In 1969, the Cubs baseball team may have inadvertently proved this theory. The Cubs were having a great year until September 9th at Shea Stadium when a black cat ran across the field and circled the Cubs batter. Not only did they lose the game, they finished the season with a losing record! Sadly today black cats are the most euthanized and least adopted from shelters even though they make wonderful pets. The Cat Fancier’s Association currently ranks the Bombay cat as 39th in popularity. The Bombay cat is also recognized by The International Cat Association. Both the CFA and TICA have lists of reputable breeders where both kittens and retired adults are available. When a Bombay cat is sold as a pet it will either already be altered or the purchaser must sign an agreement to have the cat altered. In addition, most breeders will want a deposit for those looking to buy a kitten. The Bombay cat combines good looks with a great temperament. Those who choose to become owners will find their investment is well worth while. I have beautiful Bombay cats at home and i love the Bombays. His best trick is nearly jumping from the floor to the top of the door when I put some food on it (1.99 meters). I just found out my cat Nyx is a Bombay. I got her as a rescue cat. She is a poster child for this breed; smart, playful, loving, and vocal. If she loses sight of us, she will yowl until she can physically see us. She tells you when her food or water is low and she follows us everywhere. She can be especially trying when you are trying to cook. One thing I have noticed about this breed is that they are very hard to photograph. If you don’t catch them with eyes open looking directly at the camera, they are so black that they tend to look like odd shaped ink spots. Nyx is our baby. We love her very much and she is truly a very special cat. My Bombay kitten has Gold/Orange eyes, Jet black hair and loves to fetch, he never meows, he kinda barks…lol His name is Onyx and he is a definite joy to have.